We used light sheet fluorescence microscopy to capture high-resolution, three-dimensional images of a single bacterial species colonizing the larval zebrafish gut over a span of many hours, obtaining the first measurements of microbial growth rates inside the gut of a live vertebrate. More interestingly, from a physical perspective, we discovered that growth rates are strongly influenced by community structure. We observed and identified both free, individual microbes and dense clusters, and asked if the number of free bacteria grows as the same rate as the number of clustered bacteria. We found that it does not: the clusters grow at a much faster rate than the single population. Is this just an indication that free bacteria “stick” to cluster surfaces, or that clusters preferentially grow at their surfaces, or is it a sign of something deeper? Data in hand, we can consider physical models. 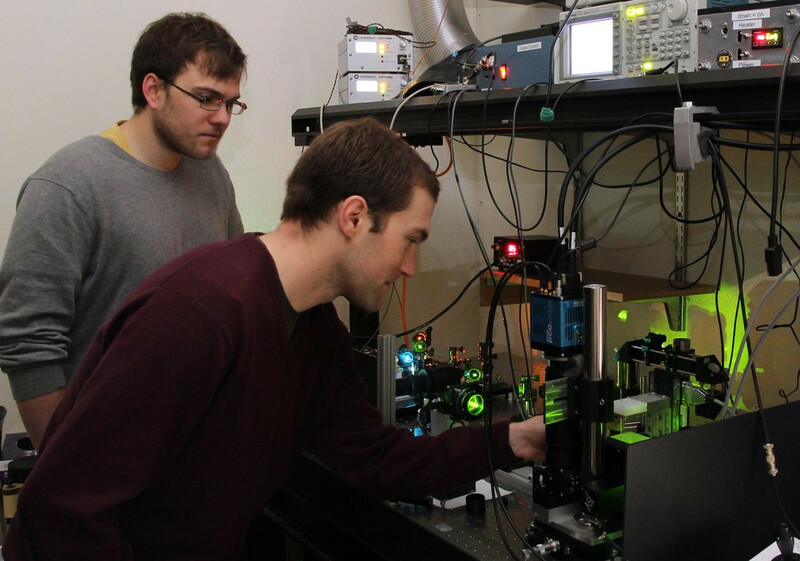 Matt Jemielita and Mike Taormina at our home-built light sheet fluorescence microscope. Is a bacterial colony like a snowflake? We understand the growth of sugar crystals, soot particles, and many other non-living materials quite well. Despite their possible chemical complexities, their dynamics obey simple physical forms set by possible mechanisms of nucleation and growth. One of our goals as physicists studying biological systems is to see whether we can similarly describe living things using general mathematical forms. More concretely, in this case, we can look at the scaling of cluster population, Nc, with time, t. Surface-mediated growth, regardless of its underpinnings, would show behavior in which the rate of change of Nc is proportional to the surface area of the cluster, and hence Nc^(2/3), from which it follows the population grows as a power-law function of time, namely Nc ~ t^3. Growth driven by all of the “bulk” of the cluster would show the rate of change of Nc being proportional to Nc, giving exponential growth: Nc ~ exp(t). Other growth modes would give different forms for Nc(t). Do our data show robust functional forms, or is biology “too messy” to allow analyses like this? We find excellent agreement with bulk-driven growth, and very poor agreement with power-laws, implying that the bacteria throughout the clusters are dividing at a faster rate than their free counterparts. (See the paper for graphs and more discussion.) In many contexts, bacteria sense the local density of their neighborhood; perhaps the same holds in the gut, giving rise to the higher intrinsic growth rate of clustered microbes. Of course all this is for just one species, in the guts of zebrafish. The real excitement will come from characterizing multi-species interactions, again exploring whether robust principles will emerge that govern cooperation, competition, and displacement of communities — all of enormous interest for understanding the complex multi-species ecosystems in both normal and perturbed human bodies. We’ve already begun these multi-species experiments, and they’re already turning out to be fascinating — stay tuned! I’ll leave you with a movie, from our paper, showing bacterial growth over several hours. Each frame is a projection of a full three-dimensional image. 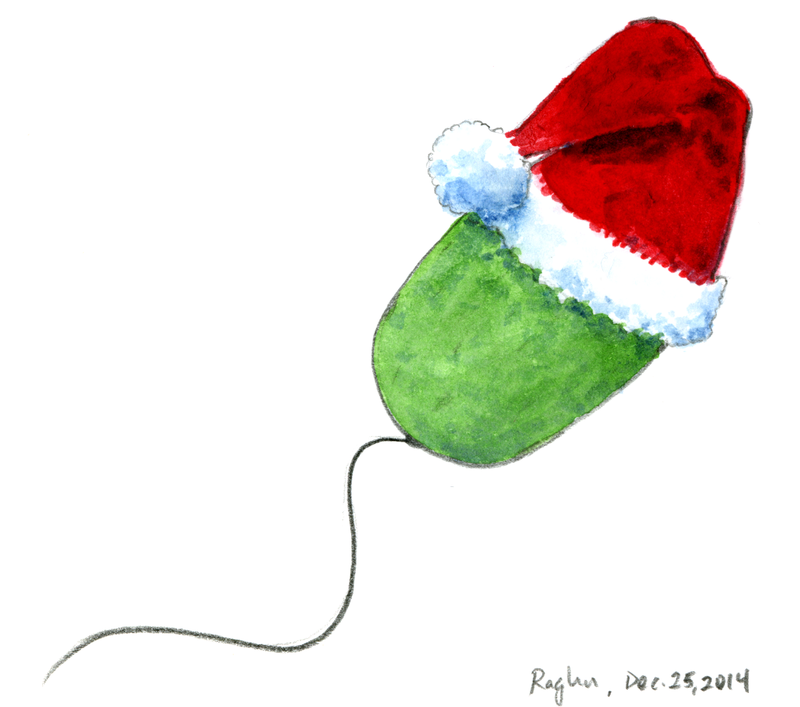 Update 12/31/2014: See the next post for an update on our cover art. Previous Previous post: Universality, Scaling, and Time-to-Ph.D.